According to folklore, the coachwhip – a non-venomous snake that is surprisingly swift – will pursue and attack a person, squeezing its victim in its coils and lashing him to death with its tail. It will even stick the tip of its tail up a comatose victim's nose just to make certain that breathing has ceased and life has ended. Otherwise, the snake will resume its lashing. In real life, of course, the coachwhip will not set upon a human, but it will certainly defend itself vigorously if cornered. The coachwhip, which includes seven subspecies, often resembles the braided lash of an 18th century British coachman's horsewhip. It is one of the fastest, longest, and most lithe snakes in the North America. Body, Length and Weight: A mature coachwhip may measure three to eight feet in length, averaging four to six feet. Slender-bodied with a long and thinly tapered tail, it may weigh only a pound or less at six feet of length. Color and Pattern: The coachwhip's eastern form typically has a dark brown to black color at the head and neck that fades, with minimal patterning, to light brown at the tail. Its western counterparts have colors that range from dark brown to tan to yellowish to gray to even pinkish with some fading from the head and neck to the tail. Its dominant color often blends with the soil color of its habitat, helping camouflage the snake. The neck area may have some cross banding. Its scales often have a braided appearance. Typically, the snake's belly is lighter colored with some to no cross banding. 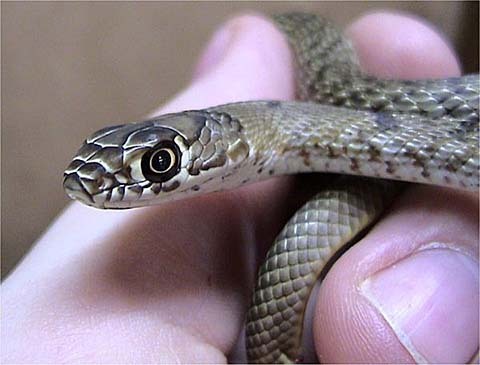 Head: The coachwhip has a somewhat angular head with large eyes and circular pupils hooded and protected by scales with shapes similar to eyebrows. It has a forked tongue that it uses to collect scent particles from the air and deposit them on its Jacobsen's organ, on the roof of its mouth. Its teeth, small and sharp, point backwards toward the throat to facilitate drawing prey into the esophagus. As with other snakes, it has lower jaws attached to its upper jaws by elastic ligaments that allow it to swallow surprisingly large prey. Senses: The coachwhip has better vision than many other snake species, and almost from birth, it can sense, with its Jacobsen's organ, chemical stimuli of favored prey. It has no hearing since it has no external ears, but it can sense vibrations transmitted through the ground. Body Temperature Regulation: Like other snakes, the coachwhip takes its body heat from it surrounding environment—the sun, the soil, the rocks. It must avoid extreme temperatures, but unlike many other snakes, which often hunt primarily in the coolness of night, the more-heat-tolerant coachwhip hunts in early to mid-morning and late afternoon. Movement: Thought to be one of the quickest snakes, the coachwhip moves sinuously over the ground and through low-lying vegetation with its head elevated, on the lookout for prey or any possible predator. An able climber, it can slither quickly up cacti, shrubs and trees either to hunt prey or escape a threat. The coachwhip occupies a range that spans most of the southern half of the United States and the northern half of Mexico. For habitat, it prefers relatively open territory. Typically, it ranges across sand dunes, prairielands, desert scrub, rocky hillsides and open pine and oak woodlands. It occurs along the shorelines of salt water beaches and estuaries up to the pinyon/juniper woodlands of mountain flanks. In the desert, the snake may frequent riverine and playa lake environments, where quarry may be more abundant. A formidable hunter, it feeds on prey such as small rodents, birds, bird eggs, reptiles (including venomous snakes) and insects. The coachwhip mates in early to mid-spring, after hibernating for the winter in a shallow underground retreat. In June, the mother snake lays some 12 to 18 eggs in a sequestered spot, for instance, beneath a fallen log, within a rotting tree trunk or in loose soil. She abandons the eggs, leaving them to incubate in the warmth of the spring sun. After a month and a half to three months, the eggs hatch, with 12- to 16-inch young emerging, completely reliant from the beginning on their own instincts for survival. Gifted with comparatively good eyesight, a sensitive Jacobsen's organ and exceptional speed, a young coachwhip soon becomes a competent hunter, able to locate, track, and run down prey with deadly efficiency. Once the snake completes a capture, it may subdue its prey by holding it in its jaws and slamming it against the ground. That, of course, makes it easier to swallow. If threatened, the coachwhip will typically retreat swiftly into rocks, brush, shrubs or a nearby rodent burrow. If cornered, however, it will hiss defiantly. It will vibrate the tip of its tail in ground litter, producing a rattling sound that mimics the rattlesnake's warning. If pressed, the coachwhip will strike quickly and repeatedly, often aiming at its enemy's face. If the snake survives to maturity, it may live for 15 years or more. If a wild coachwhip is captured with the prospect of becoming a pet, it will try with intense determination to bite its captor, and it will defecate, producing a foul odor to discourage handling. If all else fails, it may suddenly feign lifeless, playing dead, hoping it will be abandoned and left alone. Overall, the IUCN (International Union for Conservation of Nature and Natural Resources) considers the coachwhip to be a species of "Least Concern in view of its extremely wide distribution, presumed large population, no major threats, and because its population is not currently in decline." Its adult population exceeds 100,000 and may equal a 1,000,000. However, the young coachwhip is a likely prey for hawks and probably roadrunners. Its propensity for basking on roadways and feeding on roadkill sometimes make it a frequent victim for automobile traffic. In some areas, its habitat is declining due to development. In California's San Joaquin valley, in the central part of the state, one subspecies has been listed by the California Department of Fish and Game as a "Species of Special Concern" because its habitat is disappearing. The U. S. Geological Survey's Western Ecological Research Center suggests that the coachwhip could "provide significant insight into the process of speciation." This is because some regional coachwhip populations became isolated because of geologic processes such as faulting in southern California, and, as a result, they evolved as subspecies with distinctive characteristics. Some reptile lovers think that the coachwhip, especially one caught in the wild, is too excitable and prone to bite to make a good pet. Others like the snake as a pet although it takes special care. "I like snakes with an attitude," said one. Some think that the coachwhip gave rise to the myth of the "hoop snake," that is, a snake that would take the tip of its tail in its mouth, making a circle of its body, then roll along like a hoop in pursuit of prey. Richard Owen, On the Anatomy of Vertebrates: Fishes and Reptiles. William E. Cooper and associates, "Prey Odor Discrimination by Ingestively Naïve Coachwhip Snakes (Masticophis flagellum)," Chemoecology. You might also be interested in reading about the Ball Python (also called Royal Python) or Rattlesnakes. To see a list of pages about snakes and other reptiles, click here.